This section provides an overview of how InterSystems IRIS Business Intelligence supports localization of strings. The system provides a simple mechanism for localizing the names of level, measures, and other model elements. In MDX queries, you always use the logical value. The user interfaces use the appropriate display value, if available. The user configures the browser to use a preferred language, and when the browser sends requests to a server, those requests indicate the preferred language to use, if available. The server sends a reply that includes the appropriate set of strings, based on that language preference. In a similar manner, you can localize a specific set of following strings within dashboards, pivot tables, and other folder items. For these strings, you specify the original display value and alternative display values for use with other language locales. The User Portal and the dashboard viewer use the appropriate display value, if available. The user configures the browser to use a preferred language, and when the browser sends requests to a server, those requests indicate the preferred language to use, if available. The server sends a reply that includes the appropriate set of strings, based on that language preference. Specify the DOMAIN class parameter in each cube, subject area, and KPI class. The classes in the Patients sample all use the same value for DOMAIN, but this practice is not required. You can specify a different value for each class. 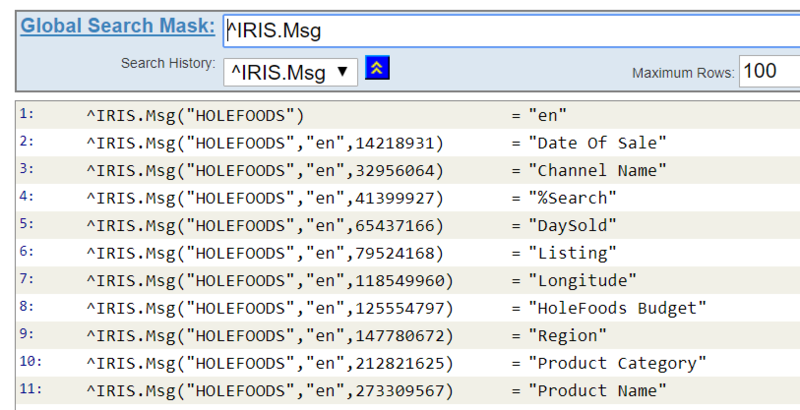 Specify a value for the displayName attribute for every Business Intelligence element. In the Architect, when you specify a name, the system initializes the Display name field with the same value. When you work in Atelier, however, you must remember to specify the displayName attribute (which is optional), in addition to the name attribute (which is required). This global (which is known as the Message Dictionary) contains the messages defined in this namespace; for Business Intelligence, each message corresponds to the name of a model element. When you compile a cube, subject area, or KPI class that defines the DOMAIN parameter, the system updates this global to include the messages defined in that class, in your default language. Each message uses a numeric identifier and has a string value that applies to the default language. If you do not see the expected set of strings, make sure that the class defines the DOMAIN parameter, that you have specified values for displayName, and that you have compiled the class. This section describes how to prepare for localization of strings in the dashboards, pivot tables, and other folder items. DeepSeeUser is the domain that the system uses by default when it looks for a localized string in a dashboard. For details, see the following sections. Extend %RegisteredObject or any other class that provides access to the standard system macros. The DeepSeeUser domain is the most convenient choice, because this is the default domain. Define a method that uses $$$Text(Localizable String) to refer to each string that the given domain should contain. Localizable String is an expression that evaluates to a string in this domain. Or, instead of $$$Text(Localizable String}, use $$$Text(@MessageID@) where MessageID is a numeric ID that is unique within the given domain. When you compile this class, the compiler finds each instance of the $$$Text macro and adds values to the ^IRIS.Msg global in this namespace. Where Localizable String is a string defined in the default domain. Where Localizable String is a string defined in the domain given by OtherDomain. If you do not include the /OtherDomain part, the system looks for this string in the default domain. Where MessageID is a numeric message ID defined in the default domain. Where MessageID is a numeric message ID defined in the domain given by OtherDomain. Change to the namespace in which you are using Business Intelligence. The specified directory must already exist; the system does not create it. The domain names are case-sensitive. For each desired language, make a copy of the message file. Change this to the language name of the desired language. This must be an all-lowercase language tag that conforms to RFC1766 (so that a user can choose the preferred language in the browser from the standard set). This tag consists of one or more parts: a primary language tag (such as en or ja) optionally followed by a hyphen (-) and a secondary language tag (so that the result has the form en-gb or ja-jp). If you exported only one domain, the file contains only one <MsgDomain> element. Optionally use the Management Portal to verify that the message dictionary has been updated. To do so, switch to the appropriate namespace, select System Explorer > Globals, and then click View Globals for the ^IRIS.Msg global. Within this global, you should see a new set of subscripts that correspond to the language you have added. In your browser, find the setting that controls the language that it requests for use on localized pages. Change this setting to the language that you specified in the edited message file. Depending on the browser, you might need to clear the browser cache, restart the browser, or both. Access the Analyzer and validate that you see translated strings. For more information on the utility methods in %Library.MessageDictionary, see the class reference for that class or see the article String Localization and Message Dictionaries.